The Bogong Rover Chalet is owned and run by the Rover section of the Victorian Branch of Scouts Australia. The Chalet is managed by the Bogong Chalet Management Group. The Bogong Chalet Management Group is responsible for managing the chalet. The Management Group is made up of Rovers and members of the broader Scouting community. The members of the Management Group are nominated at our AGM, which is normally hosted on the second Wednesday of October. The Bogong Rover Chalet hosts a number of honorary Scout Groups. The Alpine Venturer Unit was started during the winter season of the year 2000. The Unit recognises attendance and participation at a Bogong Rover Chalet Ski Venture. Established by W F “Bill” Waters during the winter of 1940, the Alpine Rover Crew exists to provide an identity and sense of belonging for all those Rovers and Scouters who participate in a winter party at the Bogong Rover Chalet. Membership of the Crew is honorary and it does not hold any regular meetings. Total membership numbers are unknown and the Crew survives simply as identity and reminder to all that have skied at the Bogong Rover Chalet that they are members of a large fellowship bound together by their shared experience. The Bogong Rover Crew was established by W F “Bill” Waters and its first members were invested into the Crew on Thursday 7th of September 1933. Initially the Crew existed for the same purpose as the present Alpine Rover Crew, however, this was changed in 1940 when the Alpine Rover Crew as a distinct group came into existence. 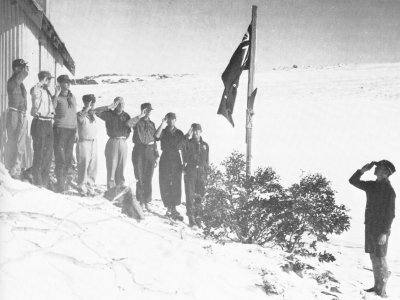 From 1940 onwards the Bogong Rover Crew has existed as an award for outstanding service and good conduct. The Crew has no permanent place nor wealth and membership is strictly honorary. All those invested into the Bogong Rover Crew are invested on skis during winter and insight of Mount Bogong, Victoria’s highest peak. This picture shows the initial Bogong Rover Crew of 1933 outside Cope Hut on the Bogong High Plains, Victoria. Approximately two hundred and ten people have been invested into the Bogong Rover Crew since its inception. In the near future we hope to provide details of the full list of Crew members. In 2004, there were no new members invested into the Bogong Rover Crew. To remedy that for 2005, a nominations form has been created. If you know of anyone who meets the membership requirements below, then nominate them by filling in this form. Due to the remote location, and all the snow, we need to do most of our maintenance activities during the non-winter months. We run a number of working bees during Summer and are grateful for any extra help we can get! Or get involved with the Bogong Chalet Management Group by attending our AGM and joining. Want to help in another way? Get in touch! Get some high quality gear, and rep the Chalet at the same time! Built over 70 years ago, the Chalet has an awesome history. The Alpine Rovers and Venturers Newsletter.